You can display .pdfs, Excel files, PowerPoint presentations, and Google Drive files on your site by embedding third-party code. This guide lists steps for a few popular services and methods. Note: Embedding files may affect your site's responsive design on smaller browsers and mobile devices. All third-party customizations and code modifications fall outside of the scope of Squarespace support. Tip: To add downloadable files to your site, use a file link instead. Use Issuu to embed .pdfs in your Squarespace site. 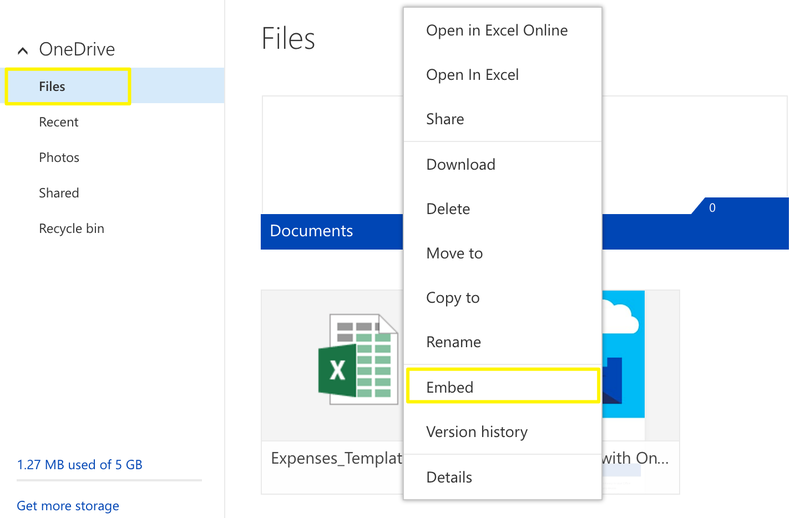 To display an Excel or PowerPoint file, you’ll need a Microsoft OneDrive account. You can sign up for OneDrive here. Upload your Excel or PowerPoint document. For help, visit their documentation. In OneDrive, open the Files page. Right-click (Control + click on a Mac) the document, and click Embed. Copy the code from the Embed code box. In Squarespace, open the editor for the page or post where you'll place the file. Click an Insert Point and add a Code Block. Paste the embed code into the Code Block and click Apply. 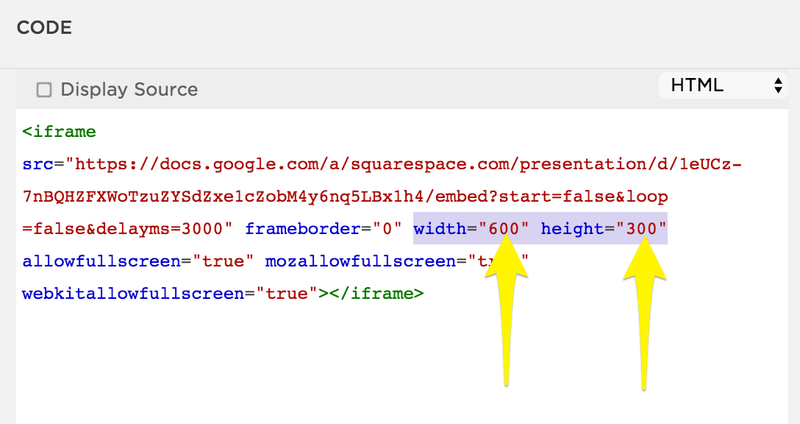 Tip: Adjust the "height" and "width" numbers in the embed code to change the display size. Note: To learn more about embedding Excel and PowerPoint files, visit Microsoft's guide. 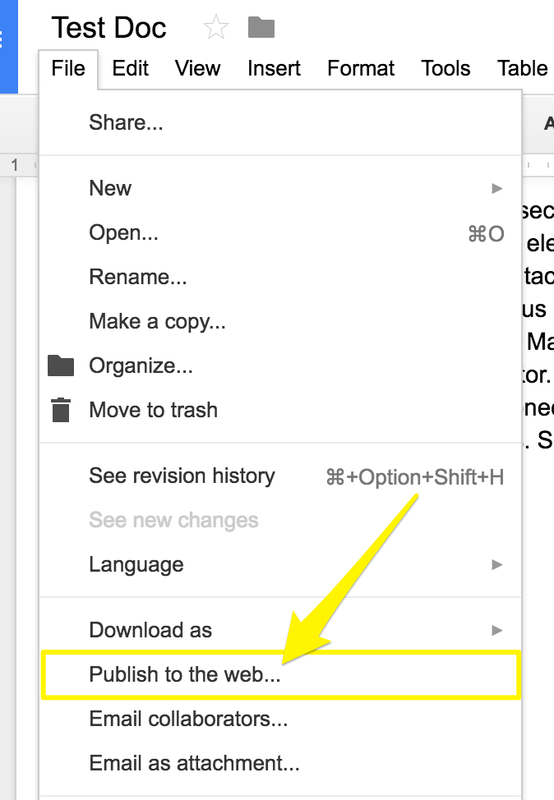 Open your document in Google Drive. Copy the code in the Embed tab. 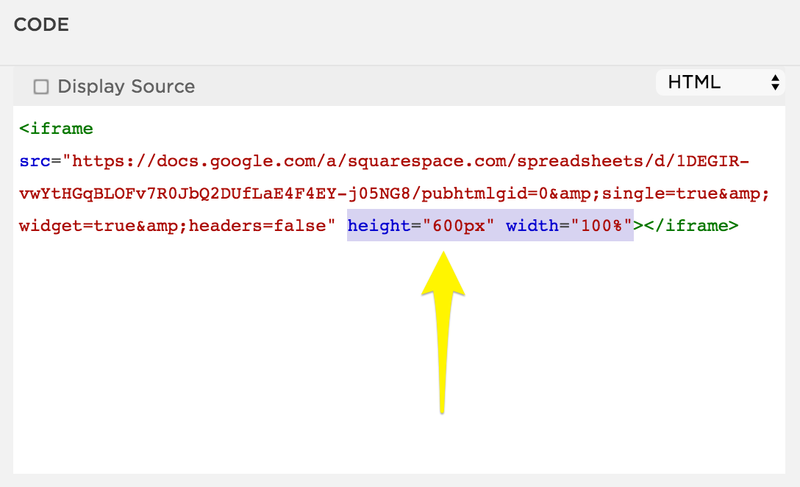 Some Google Drive embed codes, like the code for Slides documents, include "height" and "width" dimensions. Adjust these numbers to adjust the display size. Adjust the number within "600px" to change the height. To adjust the width, use Spacer Blocks. Setting the width to 100% means the document will span the width of its column. As with all code modifications, be aware that this falls outside the scope of Squarespace support. 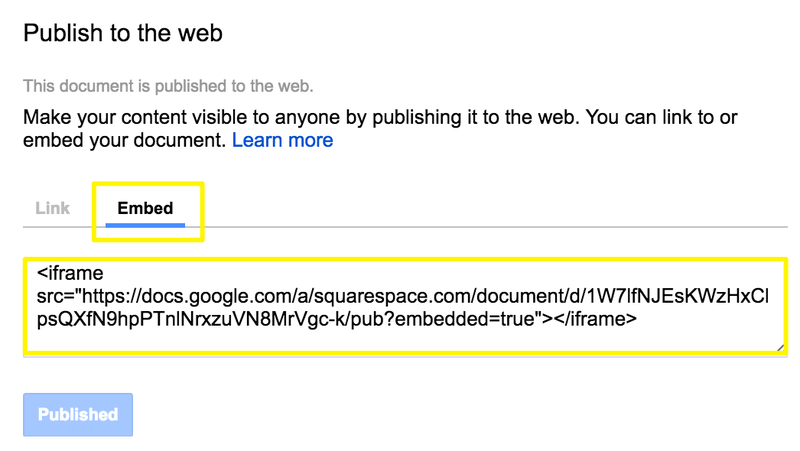 Note: Visit Google's documentation to learn more about embedding Google Drive files and setting editing permissions. Third-party customization falls outside the scope of our support. This means that we’re unable to help further with setup or troubleshooting. Additionally, since these are code-based solutions, we can’t guarantee their functionality or full compatibility with Squarespace. This includes how they function with our responsive design, particularly the appearance on mobile devices, and if they function on all templates. Third-party customizations can also cause display issues with future updates to our platform. Infórmate sobre las mejores prácticas para agregar códigos personalizados. Lee nuestra guía general sobre las personalizaciones de terceros. Visit the documentation for Issuu, Microsoft, or Google.